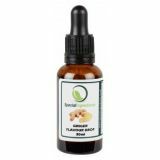 Cardamom flavour drops are premium quality water soluble intense flavours which provide an exceptionally efficient method of adding flavour. A member of the ginger family, this aromatic spice, is native of India and grows in many other tropical areas, including Asia, South America, and the Pacific Islands. Cardamom seeds are encapsulated in small pods about the size of a cranberry. Each pod contains between 17 to 20 seeds. Cardamom is either used as pods or ground to powder. It is one of the most expensive spices after saffron. 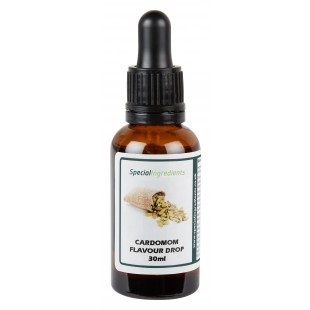 Cardamom has a pungent aroma and a warm, spicy-sweet flavour. It is mainly used to flavour food and drinks from the typical Indian Byriani dish to a flavoured tea in the Middle East and delicious pastries and breads in Northern Europe. It is also used as a medicine to cure digestion and teeth problems. They are a highly concentrated, versatile, multi-use product for both food and liquid flavourings. They should be used sparingly, 1-2 ml is ample to flavour approx 1 litre of base liquid. Each 30ml bottle contains approximately 800 drops. The drops are water-based rather than oil-based which means they disperse well in most foods and drinks. They are ideal for flavouring cakes, icings, fondants, ice cream, sorbet, cupcakes, pastry, salads, sauces, frostings, ganaches, desserts, cocktails, drinks, cream, wine, beer, water, sweets and more. Flavour Drops can also be used to enhance the flavour of a dish without changing the texture of the original product.